The Skorpion fully automatic pallet wrappers are now available from Australian Wrapping Company . These pallet wrappers feature an automatic rotary arm designed for high-production lines handling instable products, where wrapping with a stationary pallet becomes crucial to the process. 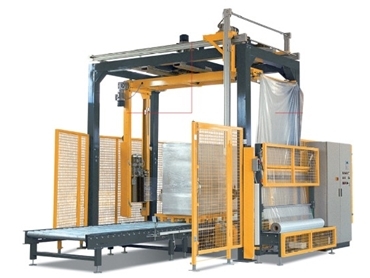 Constructed with four heavy load-bearing columns, the Skorpion automatic pallet wrappers can be integrated with almost any palletised-loads production line. The pre-stretch system is fitted with a double motor and as such, can continuously adjust the pre-stretch percentage from 0 to 350 % in order to perfectly stabilise the load.